Posted on Oct 29, 2011 by Appleton Downtown Inc. Please join us at Just Act Natural on Thursday, Nov. 3rd for a special guest we're hosting. 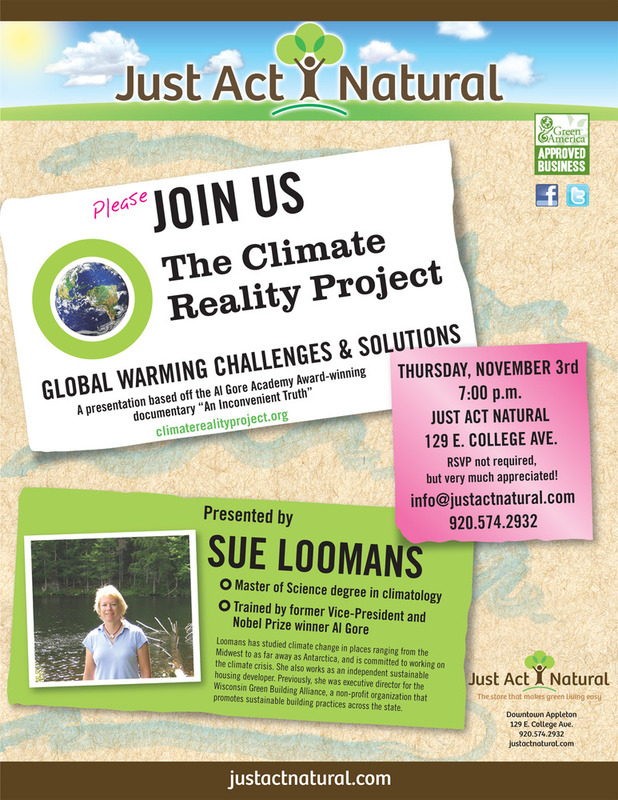 Sue Loomans will be making the drive up from her hometown in Wauwatosa, WI to give a presentation on "Global Warming Challenges & Solutions." The FREE presentation is based off Al Gore's Academy Award-winning documentary "An Inconvenient Truth." Loomans was trained by Gore to give this talk. Loomans is part of a national network of speakers who are connected to Gore's "Climate Reality Project." The Climate Reality Project is bringing the facts about the climate crisis into the mainstream and engaging the public in conversation about how to solve it. They help citizens around the world discover the truth and take meaningful steps to bring about change. Her talk will begin at 7pm lasting about 45 minutes and will be followed up with a question and answer session. RSVP's are not required, but very much appreciated. Save your seat at 920-574-2932 or info@justactnatural.com. Seating is limited. Check out www.climaterealityproject.org for more info.